DPS 84, Gurgaon believes that leader is a person who motivates others towards a common goal, leading the way by example and creating an environment in which other team members feel actively involved in the entire process. Recently students witnessed leadership at its best when the Council members for the academic year 2017-18 took official charge of their roles in Investiture Ceremony on 28th July, 2017. The deserving young talents of the school were bestowed with the responsibility of leading the school from the front. Being chosen via carefully conducted and systematic process of electronic voting and a series of interviews, the Captains and the heads took the oath of office with a promise that they would carry out their duties with integrity, faith and excellence. 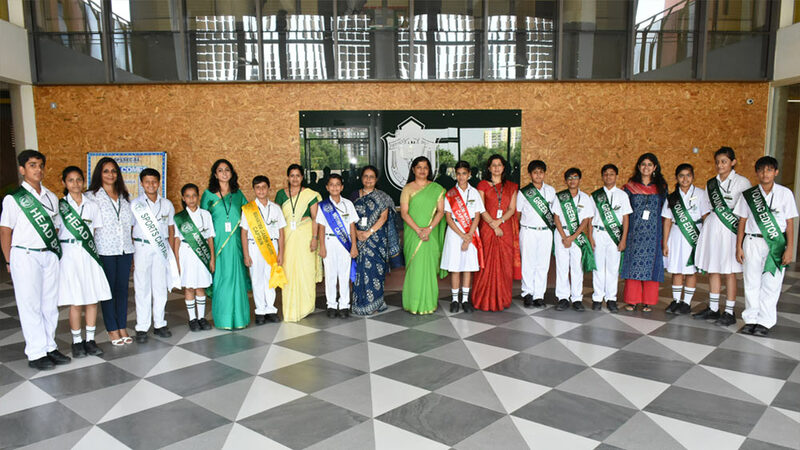 It was a solemn occasion where the young students were all prepared to don the mantle of leadership and discharge the responsibilities entrusted upon them by the school Principal, Ms. Neelu Sharma, along with the parents conferred the newly elected Council members with badges and sashes. This solemn occasion was graced by a special guest, Ms Meneka Paul Lakhanpal, the ernest princess of Tehri Garwal and Director of Christie’s India, an auction group based in London, member of our school Managing Committee and Chairperson of JPL Education Society. Principal’s inspiring speech left an indelible mark on the audience. The programme concluded with a formal Vote of Thanks and the singing of the National Anthem. It was a memorable occasion for the young leaders as they looked forward to a new, eventful and enriching academic year. The book fever swept through DPS 84, Gurugram, last week, as the annual Book week celebrations got under way. The entire week witnessed great exhilaration and excitement all around the school campus. It was a fun packed week with children immersed in a plethora of activities to develop understanding of how books can entertain and inspire all of us. 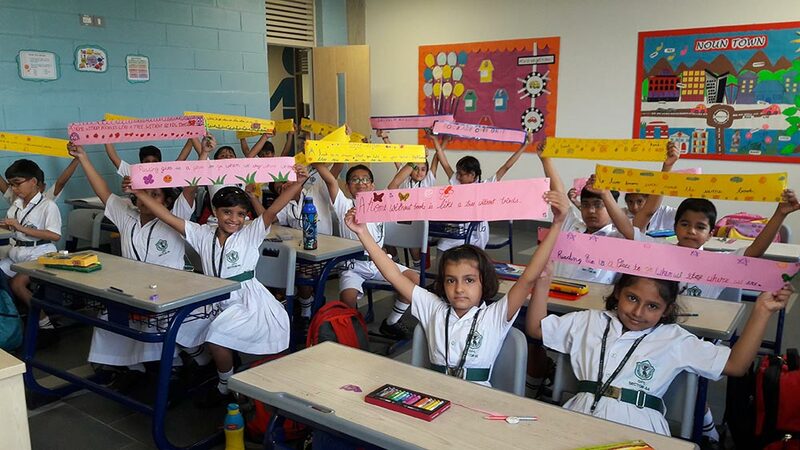 ‘Poetry recitation, designing of book marks and portfolio covers, making of finger puppets, badge making and visiting the school library, were some of the activities for the young learners of Nursery and K.G. Primary and middle wing students expressed their creative imaginations in different forms. ‘Dress up as favourite book character, story narration, drawing and colouring of their favourite poems , extempore, book review, just a minute, creation of a jingle and newsletter, etc, were some of the engaging activities for our senior students. They got a chance to expand their vocabulary knowledge, play with language and work with different rhythms and rhyme patterns. Students of Grade I & II had inspiring moments during reading sessions and illustrated, characterized and designed book covers on various book topics. Senior students remembered renaissance poets and dramatists, collected information and made charts on them. Special assembly on the theme, “Books are a uniquely portable magic”, was organized by Grade VI , wherein the students conveyed the message that every genre of book is important and if we allow them, books can transport us to a different world. The students of Grade VII displayed their euphoria for the event and showcased their talent by highlighting the importance of books in the Hindi skit titled “Kitabein hamari mitra”. Teachers of all classes enlightened the students with exceptional vocabulary words on books. The event was graced by the eminent author from Hong Kong, Ms Bhakti Mathur, who had an interactive session with the students, apprising them of her well popular series “Amma-tell me”. She emphasized the fact that reading books help in the expansion of knowledge, empathy and enjoyment! There was another special session with renowned author, Ms Ratna Vira, of the bestselling books ‘Daughter by court order’ and ‘It’s Not About You’. The honoured guest also judged the ‘Fancy dress competition, held for grade III to V.